A strong state for day-time growth? 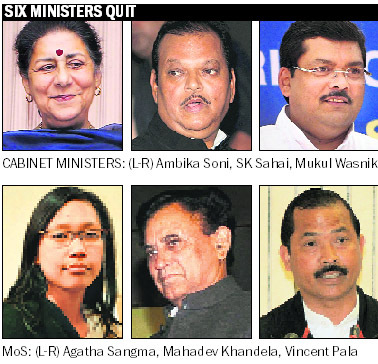 Seven ministers, including Ambika Soni and Mukul Wasnik, have resigned from the Cabinet to pave the way for a massive revamp of the council of ministers tomorrow, which will see the induction of around 12 new faces, the elevation of junior ministers and a shake-up in portfolios. 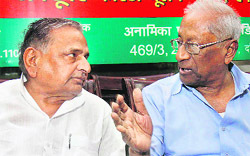 With political temperature set to rise in the coming days, leaders of Samajwadi Party, Telugu Desam and Left today came together to search for an alternative political platform in the country and attempt to draw contours of such a formation. Having resigned as the External Affairs Minister ahead of the Cabinet reshuffle, S M Krishna may have no regrets but he will perhaps miss his regular meetings with Pakistan Foreign Minister Hina Rabbani Khar which did help in reducing tension and keeping on the track the process of normalisation between the two South Asian neighbours. Punjab Chief Minister Parkash Singh Badal today disapproved of the conduct of state Director General of Police Sumedh Singh Saini in involving himself in a war of words with state Congress chief Captain Amarinder Singh. Badal, who was here in connection with Valmiki Jayanti celebrations, said being a public servant, the DGP should not have involved himself in such a controversy by issuing statements against Amarinder. For 23 years, DAV College lecturers waited for the high court to hear them. Finally, when their petitions came up this month, the court indicated that it was just too late for it to do anything.